'Barb's Beautiful BeachFront' SMacK Dab on Beach! 180 degree view! Refund policy at end of this document. Fantastic unobstructed view of the Gulf from this sixth (top) floor, 3 bedroom 2 bath condo with big balcony! Plenty of room & comfy with lots of extras including washer/dryer, some beach supplies! Nothing needed but your swimsuit and clothes for dining out at the tons of nearby restaurants. Plenty to do, you name it, it's here - all kind of shopping and sites to visit. Or maybe you just want to stay at the Condo and enjoy the nice-size pool, hot tub, or sit under one of our many tiki huts and read that book you've been wanting to read! Walk next door to the Doubletree Hotel and grab a bite to eat or a tropical drink from their outdoor tiki bar or indoor restaurant. Like cabanas - no problem, rent one. So comfortable! Dad like to fish? Walk up a block or so to the very popular fishing pier and fish the day away! Entertainment - oh yes. There are numerous restaurants, beach bars, nightclubs with entertainment nightly or just enjoy the music at the Doubletree. Prepare to relax & enjoy your vacation at this wonderful Condo! Competitively priced too! Note: Deposit is non-refundable. Full payment only refundable with emergency. Proper documentation will be required. My experience in all these years: No-one cancels a vacation unless an emergency! We love vacations and you will love it at Barb's Beachfront. I love Florida. I purchased 'Barb's Beachfront' in 1996 and have been enjoying it ever since. The view is fantastic. I just love the salt air and the feeling I get when I stay there. Apparently, I am not alone because my family & my guests feel the same way. Just coming across the final bridge to the beach makes me sigh with relief because I know I will be relaxing and enjoying the beautiful Gulf. Currently, I live in a wonderful retirement community called The Villages which is close enough for me to hop to the beach whenever it's empty to check it out, keep it in tiptop shape and enjoy the view! The best of both worlds! To me, N Redington Beach is one of the best beaches to be in. We have a nice wide street which prevents traffic jams, beautiful buildings such as the Tides (where Jon Gruden & others have a place)& we are in the middle of the beach strip making it an easy ride north to Clearwater & south to St Pete. We are just minutes from John's Pass and all the activity there BUT, thank goodness, we are not in the middle of all that hubbub & traffic. I also like our beach. There are cabanas for rent which are a perfect place to catch a tan especially when the weather may be a bit windy. I wouldn't trade my place for any other one on the beach. It is extremely popular and well taken care of. I really enjoy walking to restaurants and stores and along the beach, of course. We have some really neat restaurants within walking distance, such as the The Frog Pond, Sweet Sage, Kenny's Korner, the Conch Republic and of course, The Doubletree, next door. They are all unique in their own way. Very nice. The very best feature is the Doubletree next store. The tiki bar, the full restaurant and the music at night makes my trip to the beach so enjoyable. I love it. Heated pool, jacuzzi, barbecue area, cabanas, rental equipment. Gorgeous 180 degree view from your penthouse balcony and from inside Barb's. Steps to the warm, clear water. Cabanas, jet ski's and a beachfront tiki bar for your pleasure. Birds, boats and dolphins await your visit. 1 spot under the garage. 1 in outside lot. Large electric recliner. Just sit down and push the button. Ahh. TV, fan and other comfortable chairs and sofa. Filtered water and ice maker. Double door. Electric stove with flat top. Usually coffee filters, s&p, tea bags, oil and some spices. Fully stocked with dishes glasses, even wine glasses, cups, silverware, baking pans, fry pans and regular pans. All small and large appliances are provided. Dish clothes, pot holders. Granite. 5 bamboo chairs that swivel plus 3 stools. Extra chairs in closet for more guests. Large oval table and counter. TV's in all bedrooms (flat screens). Books are free for the taking. Pool toys and other minor toys available. Nice & big and looking over the Gulf. Lounge chairs provided around the pool for your convenience. Tiki huts and tiki umbrellas located in various area around the pool. Rented on beach. Jet skis and more. In nearby area. Check online. Yes, beach front. Be aware, other condos may have pool on street side or side of the building. This pool is directly on the beach. Extra laundry facilities on the 3rd floor. Popular restaurants within walking distance. Beach is comfortable distance to water. Beach is mowed once a week to keep clean. Penthouse view is to die for. Spectacular! Was a great time, had perfect weather, did and saw a lot of the sights. Our condo could use some updates but overall it was a pleasurable experience. It is an excellent location...and comfortably appointed. This place was perfect for our family....and I highly recommend it for families. Even though it isn't a brand new property is clean and very comfortable. The parking passes were convenient and views were incredible of the beach and water. Very nicely maintained and stocked condo. Right on the beach. Great parking and close to the elevator. Highly recommend this place. Owner is very nice and replied promptly to questions. We were very impressed with the cleanliness and layout of this VRBO! There were all the necessities and more to enjoy the housing, pool & beach. Only 2 drawbacks, and they were minor. We were told to bring laundry soap but no one did because there were no kids. We did not realize we’d have to wash beach towels. Internet speed is slow, with 5 adults on tablets/phones periodically, it did not go well. A comedy movie had been downloaded but we ultimately could not watch it. 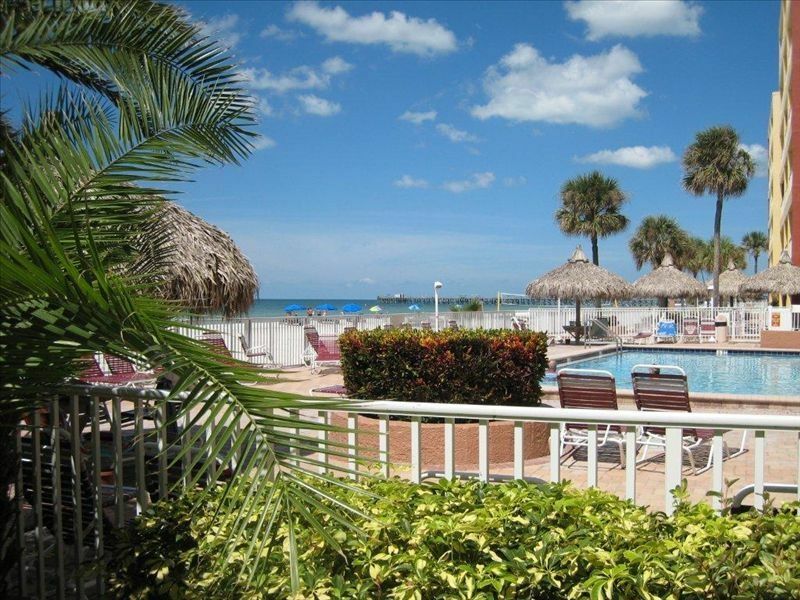 5 adults will strongly recommend Barbs Beautiful Beachfront to anyone visiting St. Pete’s beach! Thank you for your response. Yes, my cleaning service is excellent. Sorry about the beach towels but my cleaning has only a small window to get everything ready. There is a laundry room on the 3rd floor where you could have bought a packet of detergent for a small price. Sorry you didn't know. Regarding the internet speed, I pay for a faster speed but the lines in that building are jammed. The association is working with the service to get us all a better speed. Fingers crossed. BTW, no internet competitors on the beach, just one company. Boo. We took our annual family trip on the first week of September 2018 and we were not disappointed. I was most impressed with Barbara due to her attention to our concerns.She was efficient and delightful. Overall It was a great vacation spot. Minutes to John's Pass, Historic Corey Avenue, Clearwater Beach, Mall shopping, restaurants, bike rental etc. 45 minutes to beautiful Busch Gardens, Florida Aquarium, Dali Museum, Chilully Display, Mazzaro's Market, Downtown Tampa including the magnificient Performing Arts Building. VRBO has recently added the collection of County Tourist Tax in the Lodging field but the 7% State Tourist Tax has been inadvertently missed by them. To correct this, I have put an estimated tax in the state taxes and owner's fee field. Refund Policy: Deposit amount is non-refundable, this supersedes VRBO. Please consider getting vacation insurance for the full payment amount since is only refundable in the event of an documented emergency and a $200 admin fee. Undocumented emergency and non-emergency refunds are unacceptable and only given if your canceled time period is re-rented. A $400 admin fee will apply. During VALUE Season & January, there is more flexibility in minimum days and start days. Please contact me for info.